Apple on Friday sowed the "Golden Master" bunch of tents iOS 12 App shortcuts to developers via TestFlight before a scheduled launch next week. Not much has changed in GM, but Apple's development notes say that all expected functionality is enabled. Additional features will probably be added for later updates, as certain macro command options like HomeKit still appear to be limited in scope. In shortcuts, HomeKit appears as a supported app, although actions are currently limited to recently released scenes. Beyond HomeKit, the shortcuts return GM links to some third party applications. Federico Viticci noted on Twitter that the app again includes full Dropbox access, with dedicated user interface, which indicates that the addition is due to a change on Apple's side. Shortcuts were introduced as a highlight of the iOS 12 feature on WWDC 2018. Built on the Workflow app, which Apple achieved in 2017, the new app allows users to create and run app macros via siri sentences. For example, an iPhone user can create a shortcut called "I Lost My Keys" that automatically pinges a connected Bluetooth enabled Tile tracker. The app allows incredibly complex actions, with multiple services and applications tucked together through a user-friendly card-based interface. 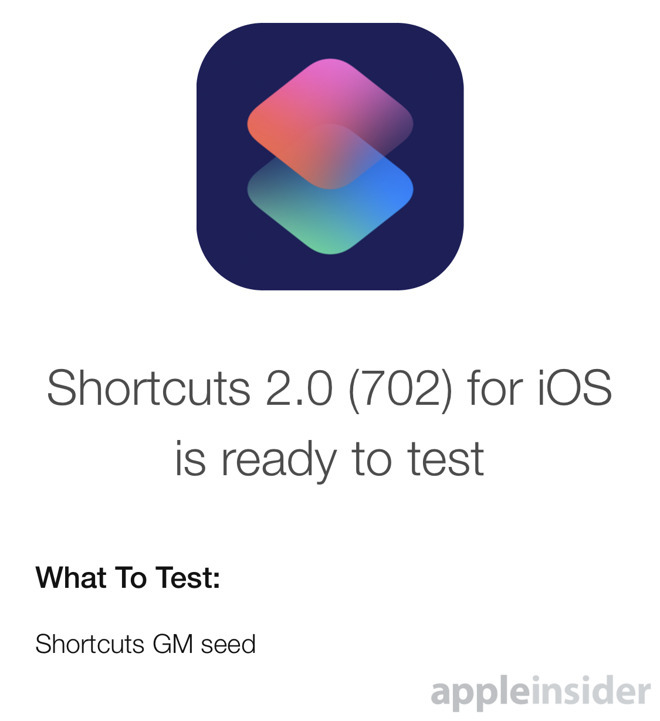 Beta testers interested in taking GM for a spin can refer to AppleInsider's Shortcuts Primer, which describes how to create, manage and use custom tasks. Shortcuts will likely be released as an update to Workflow next week along with the release of iOS 12 on September 17th.